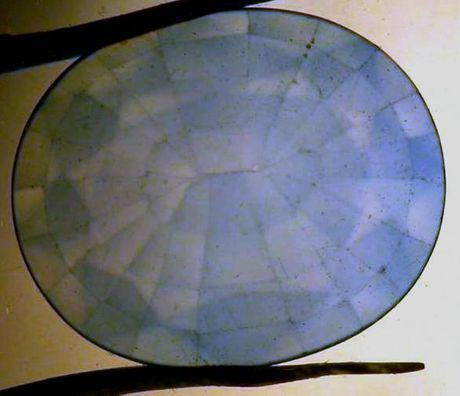 It is not only the inclusions which can be added to relatively clean synthetic corundum, but also the colour; usually, blue colour is created from the colourless corundum base by diffusion process (figure 1). The term 'diffusion', as now is widely used and understood, refers to the introduction of certain impurities into the structure of corundum, thereby modifying the colour / clarity / phenomena. Currently, the two most common impurities being diffused in corundum are titanium (producing blue) and beryllium (producing range of colour), although experiments have been done with cobalt (producing blue), chromium (producing red), lithium (producing range of colours), etc. However, colour change produced by these two diffusion processes involve completely different mechanism, which is not being discussed here. Figure 1: Natural (left) and synthetic (centre & right) titanium-diffused sapphires. Note the large fingerprint-like plane in the central stone, which can easily be mistaken for a natural sapphire. Diffusion of titanium in corundum (colourless to light-coloured sapphire) to create the blue colour has been known in the gem industry since 1980s. This treatment was developed on natural sapphires, which lacked or did not contain titanium in the structure to turn into blue by simple heating. With time, titanium-diffusion started to be experimented on synthetic colourless sapphires too and since the beginning of this century, such treated synthetic sapphires became more common (figure 1). Today, titanium-diffused synthetic sapphires have very high penetration into the market, and in large sizes; a specimen as large as 30 ct has already been studied by the author. Identification of titanium-diffused sapphires, natural or synthetic, is quite simple and straightforward in most of the cases. The typical features observed are the colour concentrations on facet edges and/or uneven facet-related colour distribution i.e. some of the facets will appear darker than the other (figure 2); these features are visible while the stone is immersed in a liquid, say methylene iodide. However, the main concern with these sapphires is to determine whether these sapphires are natural or synthetic. 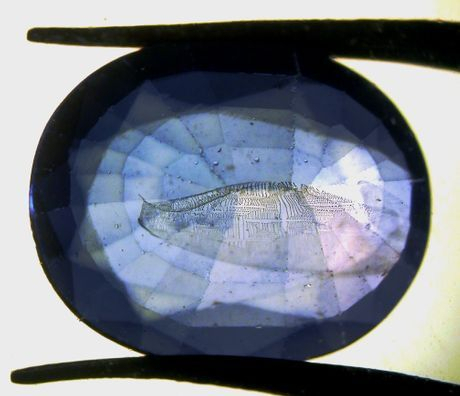 The sapphire under test can be identified as natural if sufficient conclusive inclusion features are present; however, it becomes a challenge if the stone is free of characteristic inclusions. And, the synthetic sapphires used for diffusion are commonly inclusion free! Further, when a corundum is heated at high temperatures, as is required for diffusion, the surface breaks or stress cracks are often healed with the heating residue (flux) giving appearance of a 'healed fingerprint' in a heated corundum (figure 3), as already discussed in part I. Therefore, these treated synthetic sapphires typically display uneven colouration confining to facets and healed fingerprints (healed stress cracks). Since most of the synthetic colourless sapphires are inclusion free, a casual observation can easily misidentify these diffused synthetic sapphires, as 'natural diffused'. And the author has seen many such cases! The conclusion should never be drawn on surface features alone. Stones' synthetic origin is determined (in these cases) by careful observation of gas bubbles and/or 'plato-lines', which is seen as dark intersecting lines (figure 4) in crossed-polarized light when viewed down the 'optic-axis' or 'c-axis' of the stone. However, a bit of experience, patience and proper orientation is needed to view these lines. In addition, due to heating, the visibility of these lines also gets reduced, hence, one has to be extra careful while observing the plato-lines; and lack of plato-lines does not mean that the stone is natural. Figure 3: Small surface breaking fissures or stress cracks are often healed with flux during the heating process, which give appearance of fine tiny fingerprints. These features in conjunction with facet-related uneven colouration can easily misidentify the stone as natural. Figure 4: Plato lines are seen when the synthetic sapphire is viewed between crossed polarizers in the optic-axis direction while immersed in a liquid (methylene iodide or bromoform). This feature is strongly indicative of flame-fusion synthetic sapphires. In case, if the stone does not show any conclusive inclusion, its fluorescence pattern may also assist in its identification when correlated with the colour distribution. Diffused synthetic sapphires typically display sharp facet-related chalky blue fluorescence in short-wave UV; the facets with lighter colour appear chalky blue while those with darker colour appear inert (figure 5). This is mainly because of the fact that the synthetic colourless sapphires appear chalky blue in short-wave UV, and when a layer of colour-causing impurities is diffused, it retards or diminishes the visibility of fluorescence effects. When the stone is re-polished after treatment process, the facets which are polished for relatively longer periods will lose more 'colour-causing' impurities, thereby exposing the underlying fluorescent layers / parts to the UV light. Natural titanium-diffused sapphires may display effects similar to that seen in synthetic titanium-diffused or they may also remain inert. In author's experience, most of diffused sapphires which were inert in shortwave UV turned out to be natural. colourless or pale coloured appear chalky, while those with deeper colour are inert. However, the similar effect may also be seen in natural diffused sapphires. Further detailed chemical analysis using LIBS or LA-ICP-MS displays a variation in the chemistry of the surface and the colourless base of natural and synthetic sapphires, thereby differentiating the two, but these techniques are available with only handful if gem labs around the world. Experiments of beryllium-diffusion have also been conducted on synthetic corundum, but they did not gain so much popularity in the market. One of the main reasons for this is their non-detection by visual characteristics, hence even if a synthetic corundum is beryllium treated it will not confuse with natural counterpart. why one would diffuse a synthetic sapphire when it can be synthesized in any colour? Although, synthetic corundum can be made in any colour (hue, tone, saturation) by adjusting the types and quantities of colouring agent, even then the colour is artificially induced after the growth of the crystal. But, why? May be to deceive or cheat? There is no scientific answer to this and can be a mere hypothesis. If one observes the features of a diffusion treatment quite readily, he starts perceiving the stone as treated, rather than natural or synthetic origin. And then, if the treated synthetic displays any surface-related feature such as flux-induced fingerprints / or fractures, the stone can easily be (mis) identified as natural-diffused, without taking into consideration the absence or presence of other internal features. 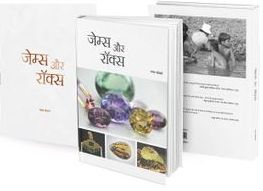 We have seen many gemmologists / jewellers who have misidentified such synthetic-diffused as natural-diffused. Figure 6: Natural or Synthetic? What if a diffused sapphire shows something like illustrated above? Rows of dotted inclusions giving appearance of broken or beaded needle inclusion in heated corundum are possibly rows of pinpoint gas bubbles or unmelted feed material. Such features when present along with those illustrated in figure 3 (above) makes the correct identification a real challenge.